Nachum presented a great morning of Jewish radio with a bevy of Jewish music legends, live music, and historic conversation. 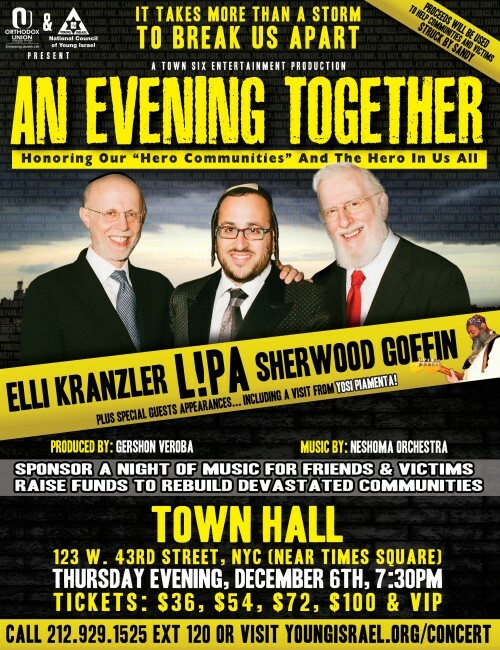 Initially a concert to celebrate the efforts and successes of those who stood strong with our brethren in the Soviet Union, on December 6, 2012 Sherwood Goffin, Elli Kranzler, Gershon Veroba, Avraham Rosenblum, Yosi Piamenta, LIPA, and others will now be part of “An Evening Together” to raise funds for the communities devastated by Hurricane Sandy. Nachum and guests discussed the importance of taking part in this historic evening that will be taking place at Town Hall in New York City on December 6. They focused on the devastation that the various synagogues of the Queens and Long Island, NY areas have experienced and why financial assistance is so necessary. Click HERE to listen and find out how to take part in the festivities or use the player below.